Breakfast Basics was one of the classes in our recent Feed Your Family Right series. We covered what it takes to build a healthy breakfast and try out a few recipes for delicious, nutritious, and easy to prepare ways to start the day. Here’s a sneak peek at what we discussed about oatmeal, including some ideas for fast and easy prep! Oatmeal is a great way to start your day. Filling and warm, it can really keep you going through your morning. Studies have shown that beta-glucan, the soluble fiber in oats, can help to lower LDL cholesterol and to slow down digestion time, helping with glucose control. The insoluble fiber in the oats fills you up and reduces hunger cravings for hours after eating. 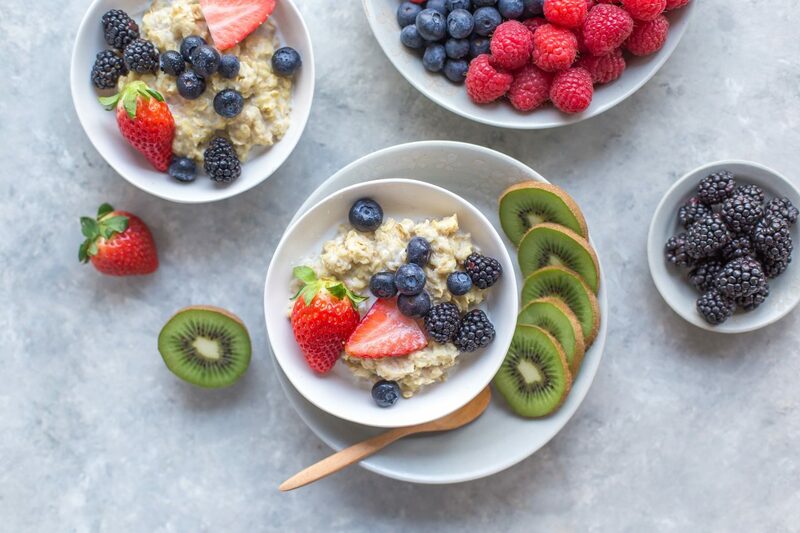 Oatmeal is inexpensive and gluten free (those with celiac – make sure that your package says so), and can be the perfect blank canvas for your favorite fruits and flavorings. Do you love homemade oatmeal but lack the time in the morning to make it fresh every day? Don’t reach for a packet of the sugary stuff, try our two hints for advance preparation and enjoy a warming bowl in as little as two minutes. If you have a favorite oatmeal recipe or brand already, make a large batch and freeze in individual containers. Take one out of the freezer and place into the fridge before you go to bed, and then zap it in the microwave in the morning for about 90 seconds at high power. Stir to make sure that the oatmeal is fully heated and then top as desired. Don’t want to even wash a pot? Try overnight soaked oatmeal instead. Place equal amounts by volume of old-fashioned oats and your liquid of choice (water, milk, or a milk replacer such as almond or coconut milk) into a container with a lid, stir to combine, cover and refrigerate overnight. In the morning, scoop out your serving into a bowl, heat for 60 to 90 seconds, and serve with your choice of toppings. Ingredients for today’s batch of overnight oatmeal – equal volumes of old fashioned rolled oats and almond milk. Want some ideas for topping your oatmeal? Think fruit, nuts, and seeds and try to stay away from a lot of sugary sweet toppings. Chopped fresh fruit or a spoonful of sugar free or low sugar fruit preserves add sweetness, as would a teaspoon of honey or maple syrup. Go easy when using dried fruits as their sugars are pretty concentrated. Toasted chopped nuts, pumpkin or sunflower seeds, and nutty flax seeds or hemp hearts all make great additions and up the ante with heart healthy unsaturated fats, omega 3’s and protein. Try swirling in a bit of plain or vanilla low-fat yogurt for a creamier alternative, or even your favorite nut butter. Turn your soaked oats into muesli by adding some apple juice to the soaking liquid and then stirring in plain yogurt and chopped apples before serving.